house. So for her safety I bought a toddler bed. But now my dilemma was what type of bedding do I use? After I stopped and thought about it for a few moments I realized I could use her crib bedding. Just because it said crib did not mean I couldn’t use it on a toddler bed. Infact I realized I went through bedding much faster when she was in her toddler bed because it was easier to change the sheets and she was bigger so she seemed to have more night time leaks. There were a few big things I noticed when we switched to the toddler bed. The biggest thing was I needed more bed linens! When she had her crib I had 2 mattress pad protectors and 4 sheets. And it seemed to be plenty. But once we moved to a toddler bed I knew, within the first few days, that I would need nearly double that. I highly suggest having 3 mattress pad protectors if at all possible. And probably 6 fitted sheets. Due to my increased need in linens I was extremely excited when I was offered the opportunity to try out the Universal Comfy Co Mattress Protector Pad in exchange for my honest and unbiased review. When the Universal Comfy Co mattress protector pad arrived I noticed a big difference from the other protector pads I owned. This one was plush and soft. It actually added some comfort to my daughter’s mattress. My favorite feature about the mattress protector pad is that it’s water proof! (IE PEE PROOF) When my daughter has a night team leak it’s usually pretty massive. And knowing I have a mattress protector that can absorb it and protect the mattress is huge. But this is why I suggest have 2 or 3 protectors. These accidents always happen in the wee hours of the morning (like 2 amish) when I am tired. So typically I take everything off the bed, toss it in the bathtub and quickly remake her bed and put her back to bed. Typically I will do laundry in the morning but with a mattress pad protector you really should let it air dry so the plastic backing does not melt. So while you are waiting for that to dry there could be another accident. If you are ever in a pinch and have to dry your protector only use LOW heat. Even low heat can melt the backing. So I highly suggest just air drying. After trying out the Universal Comfy Co mattress protector pad I am a fan. I like this mattress pad protector more than my previous pad because of the plushness. Another big difference is this protector prevents bacteria, dust mites and mold from breeding in or on the mattress. The bamboo material is naturally antibacterial, antimicrobial, antifungal, hypoallergenic, and repels bed bugs. It is also lead, latex. phthalate, PVD and BPA free. I do not believe my previous toppers did any of this. 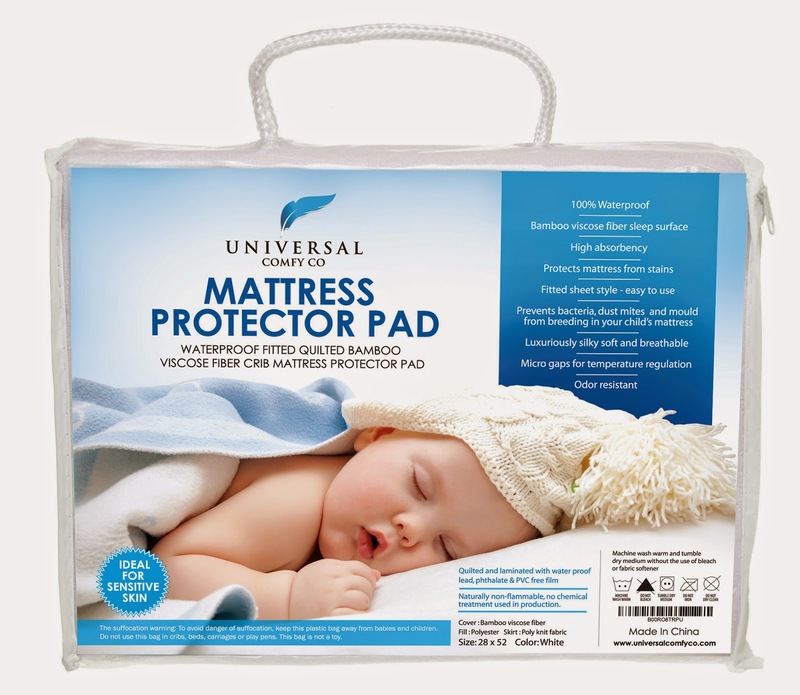 By far the Universal Comfy Co mattress protector pad is the best pad protector I have used. I received the Universal Comfy Co Mattress Pad Protector complimentary for evaluation purposes. Regardless, all opinions expressed are still 100% my own. I am disclosing this in accordance with Federal Trade Commission 16 CFR, Part 255 Guides Concerning the Use of Endorsement and Testimonials in Advertising.